Descubra Kuala Lumpur con una guía personal en un recorrido de un día completo por los sitios más importantes de la ciudad, desde las Torres Gemelas Petronas hasta los santuarios de las cuevas de Batu. Subirá a los templos de cuevas con magníficas vistas, subirá a la plataforma de observación de las Torres Gemelas de Petronas, recorrerá el Museo Nacional y los sitios del centro, luego terminará el día en una fábrica de batik local. Viajar a través de la ciudad con un conductor privado hace que sea una forma conveniente de explorar, con acceso directo a las torres y transporte de ida y vuelta desde hoteles en Kuala Lumpur y Petaling Jaya. Ver lo más destacado de la ciudad en un solo día. Tour privado para una experiencia más personal. Having arrived in KL from Singapore we were immediately struck by how busy the city was. Fortunately we booked the Full Day Kuala Lumpur tour and were treated to a first class guided experience by Vikram. We knew we were going to the Petronas Towers and the Batu caves however the tour was so much more than that. We were picked up from our hotel and driven around the centre of KL where we visited the Grand Mosque and also took in the historical colonial core, including Independence Square, and then on to the Towers. Vikram provided us with interesting background on a host of sites before making sure we got to the correct group for the Petronas experience. 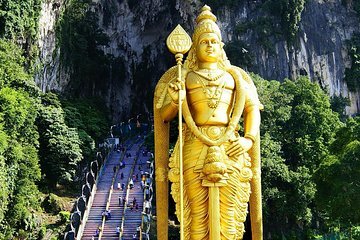 He then picked us up and took us out to the Batu Caves giving us yet more information on the hindu temple.We then headed back into the city where we saw the National monuments, Royal Palace, Botanic Gardens and a fabulous Chinese Temple. We then stopped for a late lunch in a restaurant that has never appeared on Tripadvisor but was outstanding before finishing up at the Batik factory. This was a fabulous trip with a fabulous guide and would strongly recommend that you ask for Vikram if you are considering taking the Tour . He made a vibrant city tour very special and has encouraged me to go back to KL as there was so much to see. Our first time visiting KL and we decided to book a full day tour on our first day to take in all the sites. Our tour guide picked us up promptly from our hotel. He was very informative and passionate about his city which rubbed off on us. We visited the Kings Palace, Batu Caves, Batick factory, chocolate factory and PETRONAS Towers. We also visited the meeting of two rivers the reason the city is called Kuala Lumpur. Highly recommend this tour for first time visitors of KL. This package is well worth the money you pay for it. Great way to see heaps of places in and around KL. I highly recommend this tour. Ganesh was amazing and went the extra mile to make us feel comfortable! He knows so much about KL and the history of places.